Episode 7 of this season was the second — and marginally better — half of a two-part back-story tangent that tells us the intervening events that befell the Governor between the fall of Woodbury at the end of Season 3 and his sudden reappearance at the outskirts of the Prison at the end of Episode 5. I complained that last week’s episode was slow, plodding, obvious and failed to offer any particular new insights into the Governor’s persona. Sadly, this week’s episode is still guilty of the latter, although it improves upon the previous episode mainly through improvements in pacing, characterization, and story-telling. Which, I recognize is faint praise. When last we picked up, the Governor was discovered in a man-made Walker pit by his Former Henchman (his name is Martinez) and a foraging party from a small survivor community that Henchman has assumed control of. Martinez allows “Brian” to join the group, and although this is pure insanity on Martinez’s part, we later learn it was only because “Brian” was protecting Fake Penny (I called her Fake Sophia last week, but she’s clearly Fake Penny, as you’ll see in the full analysis below). Not everything is about you, Phillip. It’s either that or the Governor REALLY hates to play golf. The camp is terrified over Martinez’s mysterious death, and uncertain of who will assume control. But, we (the viewer) knew it was only a matter of time before the Governor took over. True to form, Mitch, Petey and the Governor head out again into the woods and discover a second survivor camp but are too late to launch an attack to take their supplies before another unnamed human group does — the woods of Georgia are clearly overcrowded. Mitch walks through the camp’s dead, and mercilessly kills a wounded man rather than bring him home to their group, an act that horrifies the other men. Brian runs home to try and sneak the Fake family (now, including Alicia) away in the dead of night, but are stymied by a moat trap — a mud pit blocking the road and lined with Walkers buried waist-deep. An inventive trap, but one wonders who had the time to do this. Realizing he is basically trapped at camp, the Governor approaches Petey, ostensibly to talk about Mitch’s actions. But suddenly the Governor stabs Petey in the back, killing him. He then goes to Mitch’s trailer. 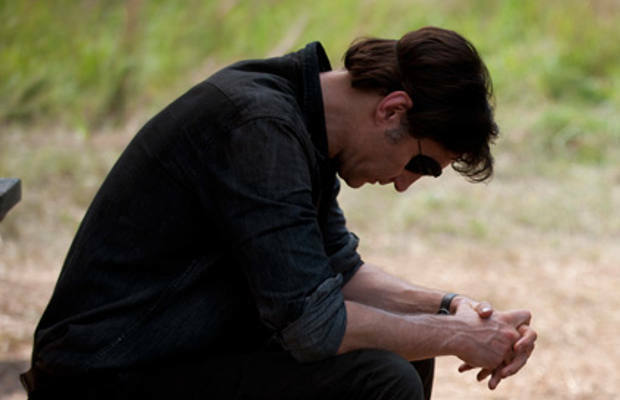 Mitch believes the Governor is there to kill him for killing the man at the rival camp, but instead, the Governor sits and smokes with him, telling him about his childhood and how it bred a “survival of the fittest” mentality in him. 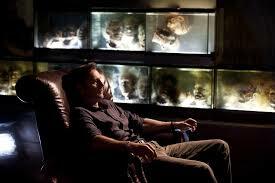 The Governor lets Mitch live, now knowing he has Mitch under his control. Together, they dump Petey’s body into a nearby lake. Kirk Acevedo (left) plays Mitch. To be fair, we all knew Mitch wasn’t going to die this episode, because you don’t cast Kirk Acevedo in a one-time guest appearance. The episode draws to a close with the Governor the undisputed “king” of the group, and planting the seeds for needing to find a more secure location. 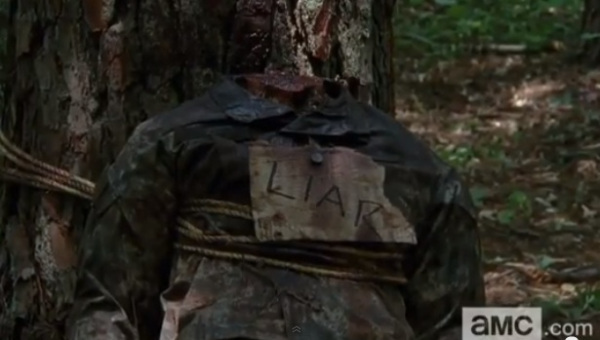 The faint protests of Fake Andrea are met by the sudden appearance of a Walker at camp who nearly eats Fake Penny; Fake Penny is saved when the Governor shoots the Walker in the head. Wordlessly, he drives out to the Prison, and the episode closes converging onto the scene we saw in the final moments of episode 5. 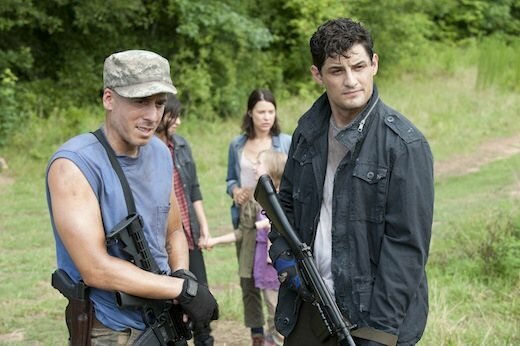 In the end-of-the-episode cliffhanger, the Governor catches sight of Michonne on the road, and draws aim with his pistol. Now that we can judge both episodes in full, we can see that this two-parter tangent — last week’s “Live Bait” and this week’s “Dead Weight” (heh, they rhyme) — were never meant to tell us anything explicitly new about the Governor. 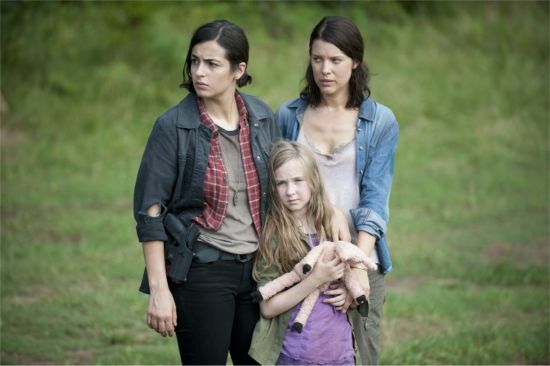 Rather, they were meant to take the aftermath of the Season 3 finale as convenient character reset; but one that would allow us to recreate the events that led up to the formation of Woodbury, and deliberately introducing surrogates to stand in for the original characters that led Phillip to become the Governor. This was character origin story done through post hoc metaphor and symbolism, and in such a way as to propose that the Governor’s evolved sociopathy is predetermined by his own self-fulfilling actions, and not an unhappy accident of the zombie apocalypse. In essence, the Governor is re-living a hellish Groundhog Day of his own making, repeatedly playing out the same personal soap opera over and over again, putting himself back into the same circumstances that originally turned him into the Governor. It’s, in retrospect, a nice counter-point to the faith meets self-determinism of Hershel as examined in the landmark episode immediately prior to “Live Bait:” one that would have been really compelling if not for a few fatal flaws in story construction. The primary issue is that the episodes posit Phillip (now “Brian”) as an unwilling participant in his recurring evolution towards the Governor, but who would prefer the mundane, homey domestic life of the Fake family before they ever took to the road. He doesn’t want to be on the run. He doesn’t want to be a tyrannical despot. He doesn’t want to commit cold-blooded murder. As he beats Martinez’s head in with a golf club and throws him in the Walker pit, his cries of “I don’t want this! I don’t want this!” are the final desperate cries of his “Brian” persona, whom the Governor is also metaphorically bludgeoning to death in that scene. But, again, the problem is with narrative pacing, and long drawn-out silent camera shots of a brooding David Morrissey (a champion brooder to rival David Boreanez in Buffy and Angel) as stand-in for exposition. My assertion that “Live Bait” was a long-winded setup for Sunday’s episode turned out to be accurate. The intention was to establish a “Brian” domestic lifestyle as a surrogate for Phillip’s original wife and daughter. Fake Penny isn’t a little girl named Megan, she is indeed (as far as the Governor is concerned) Fake Penny; Fake Andrea isn’t actually a woman named Lilly, she is a surrogate Andrea who was herself a stand-in for Phillip’s dead wife. Since the death of his family, the Governor is a man who has made every decision to try and recreate the domestic bliss of his pre-apocalyptic life, and then to protect it at all costs. Why should Phillip/”Brian” WANT so badly to protect this Fake family? Just because they are there and need protecting? 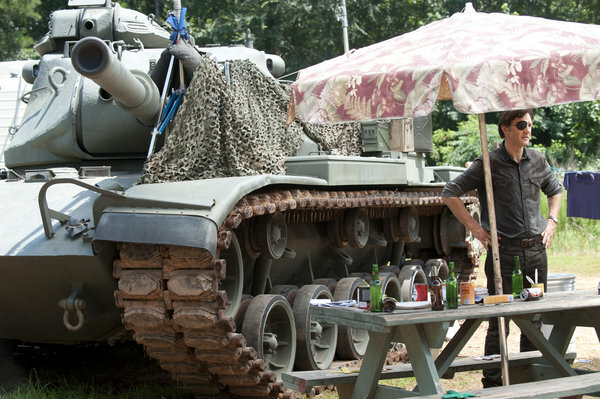 In “Dead Weight,” we watch as the Governor slowly recreates Woodbury. He (unsubtly and characteristically) kills his political opposition, and positions the most ruthless killer as his lieutenant. He establishes perimeter routines, and conscripts the able-bodied men to go on foraging trips. He uses the excuse that Petey died in a “foraging” excursion, an excuse that he used when he killed people in Woodbury and one that he will certainly use again. Even small details — the Petey Walker submerged in the lake hearkening to the Walker heads in the aquariums, and how Fake Andrea wears the Governor’s button-down shirt after getting out of bed just like the real Andrea did in their bedroom scenes — are reminiscent of Season 3. If this was your man-cave, and someone destroyed it, you’d want to remake it too. The take-home message of this two-parter was that the Governor set out to rebuild his life before Woodbury, and couldn’t stop there. Like the Walkers in the mud, Philip/Brian is trapped in the inescapable destiny of his own making to be the Governor, and all the sociopathy wrapped up therein. Another main problem with this episode was a rather confused theme. What I’ve outlined above are the notions I want to take away from “Live Bait”/”Dead Weight,” but one that is undermined by the pre-opening scene of “Dead Weight” which again references the ham-fisted symbolism of the chessboard. In it, in an unspecified time, the Governor is explaining chess (again) to Fake Penny, and basically ends up saying something along the lines of “it’s time to make a move.” The awesome “OH SNAP THEY HAVE A TANK” reveal aside, this scene suggested that (unlike in the rest of the episode), the Governor wasn’t stumbling into the Governorship, but rather that he was biding his time and positioning the circumstances to methodically take out the rival king — Martinez, Petey, Mitch. This is directly contradictory to his actions in the rest of the episode — the emotional rage-filled murder of Martinez and his subsequent weeping, the rather crude murder of Petey, the desperate escape attempt with the Fake family. Although, I can’t heap enough praise on that reveal: “OH SNAP THEY HAVE A TANK” was one of the better ones this season. My only thought is that this opening scene was meant to reference a time after the events of “Dead Weight,” where the chess rival is actually Rick and the Prison. But, if so, there are insufficient other cues in the scene to indicate that this is an interspersed flash-forward. Ultimately, I think “Dead Weight” sort of redeemed “Live Bait,” but only marginally. I’m glad that the writers were a little bit smarter than they let on in “Live Bait,” and did ultimately fall into an interesting new concept to explore in the Governor, in the form of the endless Groundhog Day notion. But, sloppy or lazy writing and obvious plot devices (gah, chess) were used to get them there, and that is generally an unforgivable crime in an otherwise smartly written show. That being said, the episode ably accomplished one thing: a great cliffhanger to lead into the show’s mid-season finale. Will the Governor shoot Michonne in front of Hershel (unlikely)? 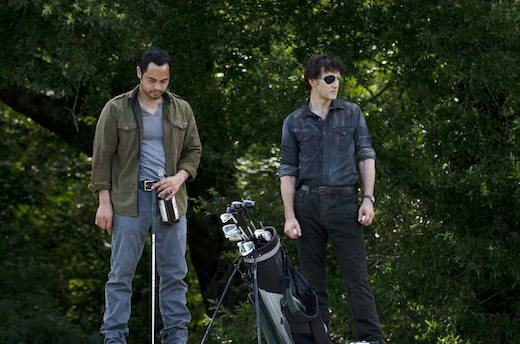 How will the Governor convince Fake Woodbury to take on the Prison? What happens if (and when) the Fake family discovers “Brian” has been lying to them? Will the Prison fall next week? And, most importantly, how is driving an ice cream truck anything like driving a tank?